Julie Symmonds is the first Dance for PD® Certified Teacher in Africa. She started ballet classes at the age of 5 years old, and continued dancing throughout her school career. Ballet was her first love and led to Julie completing the 3 year Diploma in Dance at the University of Cape Town, graduating with a first place in Teaching Methodology and Drama. Julie then travelled overseas, experiencing Europe, the UK and Ireland before beginning her teaching career in 1997. In October of 2015, she attended the Introductory Teacher’s Course at the Mark Morris Dance Center in New York as the first South African to complete this training, and she launched her first class at the Playhouse Theatre in Somerset West in 2016. Julie was honored by a Stanley J. Wertheimer Fellowship in the same year, allowing her to continue her training process. In 2017, Carmen Davidson joined Julie and together they launched the company Dance for Parkinson’s S.A Pty ( Ltd). Julie returned to New York in October 2017 to spend a month completing the Advanced Training and Certification program. 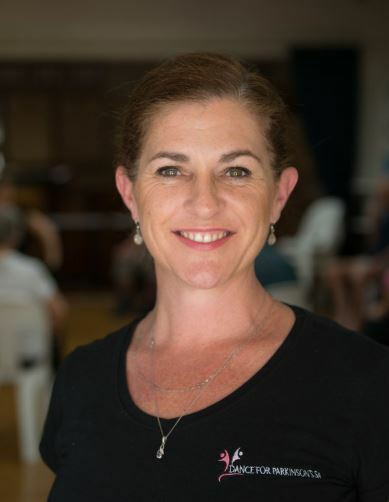 Julie is now one of a select group of practitioners worldwide who are authorized to train other dance teachers in the Dance for PD® program, and has presented training workshops in Johannesburg and Durban. She currently oversees a network of 7 classes in and around Cape Town! Since the inception, Dance for Parkinson’s S.A has been featured in numerous newspapers, magazines, television and radio. For information, please call Julie: 082 978 2399 or Carmen: 083 795 5610 or email info@danceforparkinsonssa.co.za. For information, please call 082 506 7376 or email barbara-restoration@connect.co.za. For information, please call 082 254 0915 or email sandrakruger@gmail.com. Local network affiliation: Dance for Parkinson’s. S.A.
For information, please call 083 407 3148 or 033 330 4881, or email penzil@polka.co.za. For more information, please call 082 561 4757 or email marna.bolt@lantic.net. Two Classes on Thursdays at 10:00 a.m. and 11:30 a.m.
Dance for Parkinson’s S.A. is an officially licensed Dance for PD partner. For more information about all classes, please visit www.danceforparkinsonssa.co.za or contact send email to info@danceforparkinsonssa.co.za. Phone calls may be directed to 082 978 2399. For a podcast about the program, please click here.